Father? Everybody gets in an uproar the minute anyone mentions the trigger sentence for mental health care—I am depressed! Man O man! Psychiatrists, physiologists, counselors et all, Welcome! Prozac along the whole agglomeration of antidepressant drugs, come on board! On the unsuspecting fool embarks to his own destruction! Depression—the core problem in human existence! Is there a solution for such complex problem? Funny thing! Has it occurred to anyone how the adherents to the Christian Bible, to the Torah and to the Qumran all claim to have the answer to the human problem, but in the reality of this world’s affairs none have come up such an answer? Why? For one simple reason: All such adherents with all the braggadocio are nothing else but claimers of empty claims no different than the secular world’s claims to help the unsuspecting fools inhabiting this earth only to embark them to their own destruction by way of chemical & mind/emotional therapy—it all almost cost me my physical life! Same thing with all religions! What am I talking about? I am talking about experience—my own experience of all of those rebellious braggarts that are actually set up at the head of all worldly authorities! From heavy drugs dull my mind & silence my spirit to electric shocks my ignorant submission allowed them to almost destroy me more than once—I am, literally, a walking miracle! No kidding! What is wrong with all of those religious braggarts? They have placed the Almighty Creator of our beings in a box of their own making! Most scandalous yet is the fact that they have placed the carnal self over the Almighty with the claim that the carnal self can overcome the lusts & wantonness of the same by the practice of their man made rules & regulations! The time is here to suffer the disastrous culmination of all doctrines shoved on all human beings by those ‘holy’ & braggarts and adherents to the religion of their own making! Yet, human beings have no excuse! Just like I had no excuse! We have no excuse because when the Almighty has blessed us bountifully we have attributed such blessings to the carnal self instead of recognizing & giving thanks to our Creator! What am I talking about? I am talking about the same thing that I have been writing for almost 30 years now. I am talking about human beings programmed to be their own gods!—the deifying of the carnal self-ingrained in all human beings! Read it in Romans chapters 1 to 3. 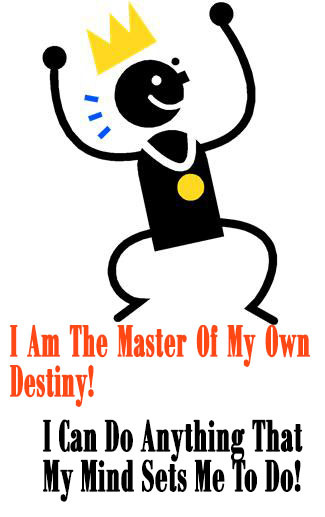 I Am The Master Of My Own Destiny! I Can Do Anything That My Mind Sets Me To Do! O yeah? Can you set your mind to create an entire new Universe with a throne for your own self? Let me know about such event so I can take cover! So? What’s the point? The point is that the whole kit & caboodle of religious & secular authorities over all human are dead set in upholding the deification of the carnal self and the people that belongs to our Creator are in perfect agreement with them out of ignorance of their rightful identity! That’s that! And that’s my Father’s business! For myself? I’ll keep on posting, posting & posting in obedience to His instructions! Let him who has ears hear what the Spirit of our Creator is saying from the throne of my heart!